The former RBS in Huntly has been taken over by the community. A mothballed bank building in Huntly is to be transformed into a new business centre. The former Royal Bank of Scotland branch was taken over by the Huntly Development Trust last year. And now, the group has revealed it is turning the building into a centre for small businesses, self-employed workers and micro businesses in an effort to regenerate the town and create local employment. The move has been confirmed after the trust received £56,500 from the Scottish Land Fund. The business facility will be known as The Hive, and will offer a range of affordable office, meeting and hot-desk spaces for new start-ups and business support services. Huntly Development Trust director and The Hive project lead, Bruce Murray, said the money will have a direct impact on the town centre and the community. He added: “The Trust is delighted to receive support from the Scottish Land Fund to enable us to secure a strategic building within Huntly’s historic town centre. “In recent years, the town has seen a gradual exodus of retail and service providers from the town centre and we’re excited to be able to kickstart the re-generation process with the opening of our Hive co-worker facility. “The Hive will allow small and micro businesses to cost effectively, get off the ground without some of the challenges normally faced by a fledgling business. “Its aim is to provide a sharing, creative and thriving environment that will hopefully allow these embryonic start-ups to grow into larger local employers in the not too distant future. “By securing and investing in the former RBS branch offices, with the help of the Scottish Land Fund, we believe that this community purchase will be the catalyst for further entrants to come back into the town centre whether it’s to work, stay or invest. The Huntly RBS branch was among 62 across Scotland to close last year. Aberdeenshire West MSP Alexander Burnett said: “This is very welcome news and great to see a former RBS bank being retained for community use. “Across Aberdeenshire, these empty branches risk becoming a blight on our town centres. “In Huntly, the bank occupied a prominent spot in The Square, and I’m sure locals will be happy to see it remain in use. 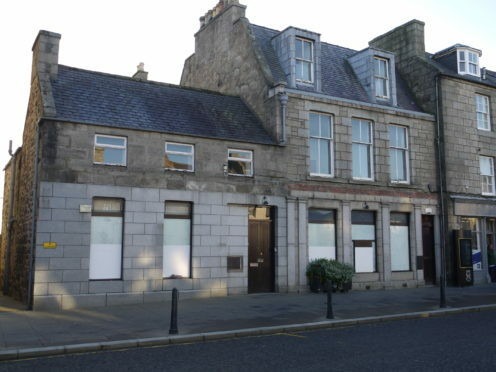 North-east MSP Mike Rumbles said: “Although it is shameful that banks have been closing across the north-east, I am pleased that this former bank will now go on to be another great asset to the community in and around Huntly. “It is innovative ideas such as this that will ensure our local economy is robust and fit for the future. “As the way the economy functions changes we must provide support to new business to ensure they are successful. “I would urge similar projects to apply to the Scottish Land Fund for grants.